I woke up, trying to retrieve the plan for the day to my consciousness. Monday. More packing boxes. Oh, right. I have an ultrasound on my eye, preparatory for the cataract surgery, late in the afternoon. Monday. Construction on the subflooring is scheduled to start, but the backfilling hasn't been done yet. Unknown what their plans are. No reason to get up quite yet. Inauguration things are playing on the TV, instead of the usual Today Show wake up. I'll watch from in bed until there's a commercial, when I'll go to the kitchen and get Chloe's breakfast and her medication. That will be followed by scrubbing all the raccoon slobber out of the feral cats' bowls and feeding them. Then "the boys," Henley and Jean-Luc, get let out of the kitten room and are given their morning treats. But not yet. I became aware of clunking noises outside the window, the window by the construction site, not the deck where the feral kitties crash around playing. I jumped up to see whether construction was starting. 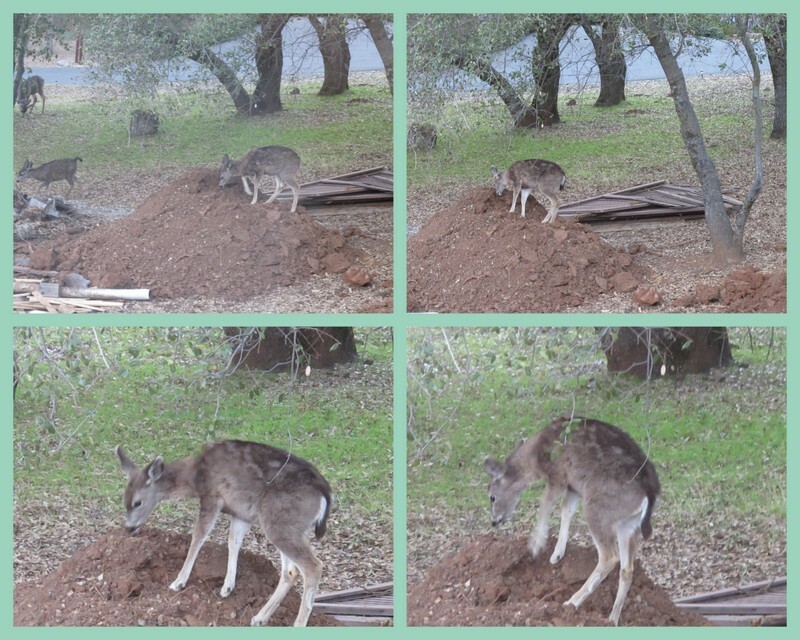 There were deer everywhere, rooting around in the broken box that used to protect the outside water faucet from freezing -- with straw. They were grazing under the trees, nosing up to the slab. "There's something up here." "It's in there, I can tell." "I'll find it!" "I can get it. I'll just dig deeper." Cats are fed. I am fed, but while I'm eating and drinking my coffee, instead of reading email and checking Facebook, I take pictures of the TV screen of the Presidential Inauguration. Hundreds of pictures. The number that comes out well from across the room in an easy chair won't be that high, but I want to capture the color and the feel. Some may actually be reasonably good. I found I had a hard time keeping the rectangle of the screen within the border of my camera's field as I had an automatic reaction to follow someone I was focusing on even if NBC or CNN didn't and I'd follow right off the edge of the screen. A bit after cats and breakfast, I heard door-slamming noises out front. Craig and the concrete contractor were out there on the slab. Oh, goody. But when I returned, they were gone. About 10:15 the phone rang from the ophthalmologist's office. The technician had called in with the flu, and we didn't want him to give me the flu. She's right about that. Even though I had my flu shot back in September, some shot recipients still get it. I don't want to be one of the some. The trip to Yosemite is coming up. So are forecasts of showers/rain in Yosemite, day after day after day. We just hope it doesn't snow on our way in. The visit to the ophthalmologist is postponed until mid-February which I met with a great sense of relief. That's at least three hours' time I'll have at home to get more packing done and pay attention to the inauguration. In another 15 minutes, the excavation people arrived and began to fill the ditch for the propane line, and put in a drainage system along the new foundation to take off the water coming down the slope and off the roof. And clean up the dirt, pulling chunks of both asphalt and tree roots out of the dirt, and scraping off the driveway. After hauling what I thought were all the pictures from my bedroom and soon-to-be old study to Garage-Mahal just Sunday evening, an array of family photos on my dresser top smiled at me when I got home. Then there were the jewelry boxes on top, and a drawer full of additional stuff. Earrings dangled from ribbons looped over the corners the mirror. Little covered porcelain and metal dishes for stashing treasures rested on a brass tray, along with a little ivory sitting Buddha and a joyful carved wood one. Other containers for one collection and another. Clutter, clutter and more clutter. Too much to sort into worth keeping, worth donating and worth tossing before storing, so I wrapped and bagged and stuck them all in the box, and the errant pictures lay neatly on top. Things like these dusty awards have now been photographed for memories, and they will be tossed. The guys worked a long time on clean up. I thought for awhile they'd taken the Case Super 500 with them when they left, forgetting one of their scoops, but I later spotted the big backhoe hiding off among the trees. About 3:30 I heard more door-slamming and looked out to see Craig's vehicle and an unfamiliar white truck. This time I went out, since I wanted Craig to check the temperature setting on my water heater. I can't get through a shower without it cooling down. Not good. He raised a little and I recognized the other person as the guy who will do most of the building, Tom. Tom built the gate for my deck to protect the cats from the marauding dog; and, better still, he did most of the work on Garage-Mahal. Tom and Craig whipped out saw horses and set them on the slab, and stashed saws and other tools in the basement. They'll be back Tuesday morning to start work. Sister tells me Tom starts at 8 a.m. sharp. Here are pictures I found lying flat on the dresser, unframed, unenjoyed. I shot them for inventory purposes, as I've done with the books, just so I'll know what and where they are -- in the top of the dresser top box. Surprises for the day still weren't over. More thumping on the deck, such that I thought the cats and raccoons were having an altercation. I went out to find a UPS lady struggling with a large package and the gate. I'm guessing she had lifted it over the gate, rather than open it. It's not hugely heavy, just largely awkward. Costco had a sale. I'll put the new TV in the bedroom, I hope wall-mounted, and move the current bedroom TV into the sewing room and wall-mount that one, too. New toy and dresser-top storage box. I sat down, intending to clean up my notes, and contemplate whether I'd finish up a can of beans I have in the fridge for dinner. The phone rang. It was Sister on her number up here. I thought they were coming up tomorrow. They were going to the Mexican restaurant for dinner. Did I want to come? Well, sure. Another change of plans for the day fits right in. These photos about what I did today are interspersed among the 200+ inauguration photos I took. I wanted to collage some of those and intended to start this blog with a collage of faces, but what with going out to dinner, and the expectation of hammering and sawing in the morning, I'd better get to bed tonight and leave the collaging for tomorrow. Hope all is well with the cataract surgery and the construction project. Looks like you have a few curious creatures to keep you company - that picture of the buck is really good. 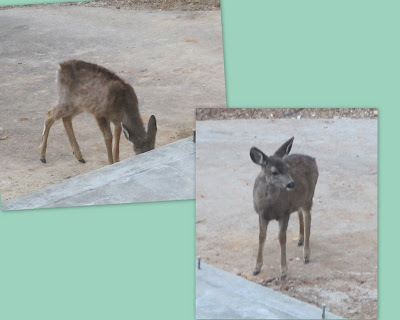 Our deer are too skittish to let us get good shots of them. They even see our movements if we are inside the house. I think being able to change plans on the fly is a skill we have to learn--it certainly saves a lot of aggravation! I can plan to do 6 things by sundown, and I'll be lucky to have 1 or 2 done, but there will have been a dozen other things that came up in the meantime! The construction is really moving fast! You'll be able to move into your space before you know it!